The ancient Roman poet Ovid tells the tale of the sculptor Pygmalion who creates his ideal of a woman in the medium of a statue. In George Bernard Shaw’s “Pygmalion” and the Lerner and Loewe musical “My Fair Lady” which Shaw’s work inspired, Professor Henry Higgins attempts to create out of a common flower girl a lady of grace and upper-class elocution. Yet how successful will Higgins be in “taking a human being and making her into another human being,” as the good professor phrases it? By far the greatest asset to the production is Megan E. West as Eliza Doolittle. Her beautiful and powerful singing voice shines through as she performs the classic song from the show “I Could Have Danced All Night” as well as the lesser-known “Without You.” Megan makes her way believably in diction and behavior from the Cockney accent and phrasings of the lower-class street flower seller Eliza to the “received pronunciation” and high manners of the “fair lady” Eliza she will become. This talented actress rises particularly to the challenge of portraying the transition of Eliza, still caught between two worlds as she has tea with Henry’s mother while exhibiting the polish of Eliza’s new upper-class accent with the register of her still-prevalent Cockney slang and grammar. Ken Kemp is also quite good as Professor Higgins, ever confident in his smugness and delivering such witty lines as “the question is not whether I treat you well, Eliza, but if you have ever seen me treat anyone else any better.” Vocally, he acquits himself well in the humorous Lerner and Loewe tunes “I’m an Ordinary Man” and “A Hymn to Him.” Brian D. Kaider is dashingly handsome, kind, and considerate as Colonel Pickering, the author of Spoken Sanskrit, who places a bet with Higgins that he cannot turn Eliza into a duchess within 6 months. Some of the strongest musical moments occur in chorus songs such as “The Servants’ Chorus” and the “Ascot Gavotte,” in which upper-set men wear morning coats and society ladies sport Victorian dresses, all the while affecting snobbish body poses for the horse race social event at Ascot. The success of the Way Off Broadway production rests also with the simple yet effective choreography of Melani Drummer and the crisp direction and beautiful sets and costume designs of Bill Kiska. (Fans of the Rex Harrison-Audrey Hepburn film version of “My Fair Lady” will rejoice, as the costumes here are quite similar to the movie.) A marble-like arcade convincingly becomes a Victorian (or rather Edwardian) London Street. The interior of Higgins’ apartments is well-detailed and loyal to the era. There is a costume surprise during Eliza’s solo “Just You Wait, ‘enry ‘iggins,” as she imagines a king dressed as in a storybook. Another unexpected moment manifests itself in a slightly more romantic ending than in some other versions of the musical, but one which is sweet and by no means overdone. As is usual at Way Off Broadway, the music is recorded, but the sound mix is very good. While songs such as “I Could Have Danced All Night” and “The Rain in Spain Falls Mainly on the Plain” are still well known, the recorded Broadway-style orchestra somehow works well to place emphasis on certain musical selections such as “On the Street Where You Live” and “I’ve Grown Accustomed to Your Face,” both once better known as stand-alone pieces (“standards”) but now known almost exclusively as pieces within the show. In sum, Way Off Broadway’s witty and smart production of “My Fair Lady” more than lives up to announcer Justin Kiska’s claim before the show that the performance would take the audience back to the Golden Age of Broadway! Running Time: 2 hours and 30 minutes with one 20 minute intermission. 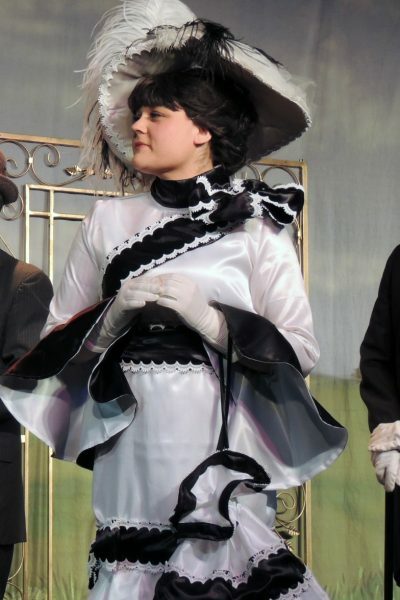 “My Fair Lady” at Way Off Broadway Dinner Theatre runs through June 1, 2019 in Frederick, MD. For more information, visit online. Dr. Mark Dreisonstok is a professor, editor, writer, and translator in the Washington, D.C., area. He holds a PhD from Georgetown University and an M.A. from the University of Freiburg, Germany. He has published in the Scottish Rite Journal, the Prince George’s Sentinel, Monatshefte, Trowel Magazine, and on-line at Fairfax News.